Today, I thought I’d share a little bit about the design decisions we’re currently working on. A couple months ago we finalized our cabinet decision. We ended up going with the Vedigne from Ikea (more on that here). We both really liked the look of them in the store, and even though they’re a bit more modern than I was originally envisioning for this old farmhouse I’m excited about them. Now, we’re finalizing our backsplash option and countertop idea. 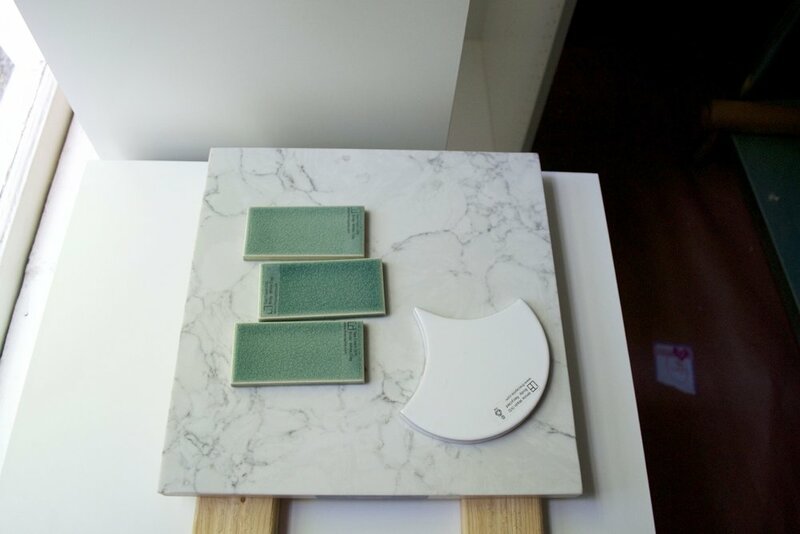 For the types of countertops we looked primarily at quartz and concrete. We ultimately decided on this really gorgeous quartz in a marble pattern that I’m very excited about. I love the look of marble, but we cook a ton and the upkeep it requires just wasn’t going to work for us (not to mention the price!). And surprisingly, the durability was the biggest problem with the concrete also. We considered both a DIY option and having someone local install it. When we met with the local installer he told me that even condensation from a glass of water could potentially damage your countertop. I’m not interested in the worn look and also could not stand the thought of having to use coasters on my kitchen counters! But, it doesn’t really matter because I’m so excited about the look of this counter top we decided on. It’s the prettiest marble pattern quartz I’ve ever seen and was by far my first choice. Everything else we looked at had this pixelated quality to it. I’ve since learned that that’s the pieces of the quartz crystals, but to me it looked very grainy and fake. That’s one of the things I love about what we ended up with – it doesn’t have that at all. Plus it has a lot more movement and contrast than the other samples which I think will be very interesting mixed with the backsplash and the cabinets. This is the countertop we're going with. These are two other samples we were looking at and are pretty representative of almost everything we saw. The pattern is very faint. You can see a little of the "pixelation" in this picture. The concrete had an organic look to it from the local river sand they use. When it comes to the kitchen backsplash we debated so much about what to go with. We explored tons of options from many different stores. 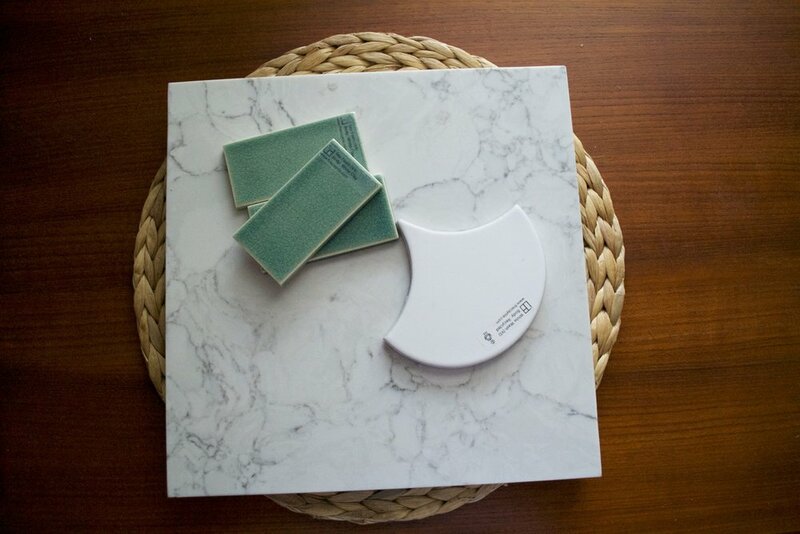 See our big box of tile options 🙈 But, when I found Fireclay Tile I was in love. For starters they have gorgeous tile options and second, but almost as important to me, they have the best team. (Shout out to Lauren who’s been with us through all the color changes!) This is not at all a sponsored post; I just loved working with them and would do it again in a heartbeat. 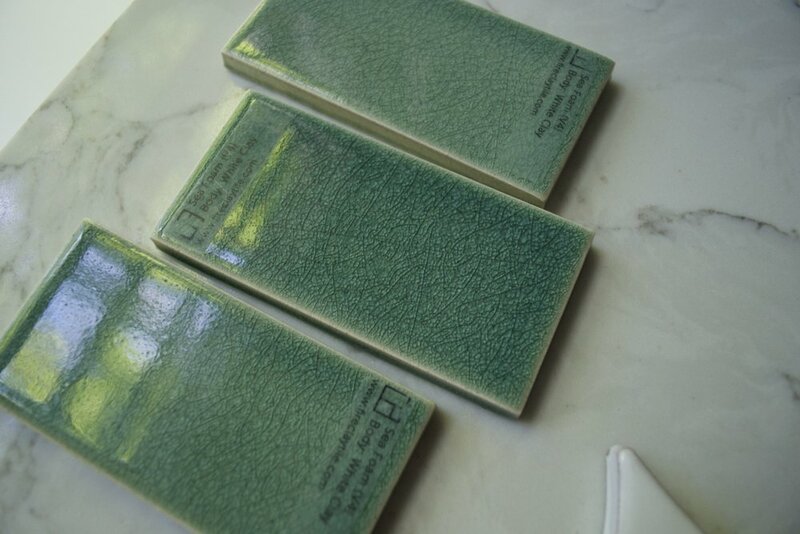 We debated so many colors, but ultimately ended up going with Sea Foam, which is a really pretty green with lots of variation and crazing (the pretty crackling you see on glazed tiles). I think if I could choose any color at all I would have gone with some sort of blue, but our heart pine hardwood floors have a pretty significant orange hue to them. On it’s own it doesn’t look bad, but because blue is a complimentary color to orange anything blue would have really played up the orange in the floors. So, in the end I decided to stay away from blues. And I truly love the color we decided on. As for shape, if you know us at all you know it wouldn’t have been a true decision if we didn’t think about it for much longer than we should have. 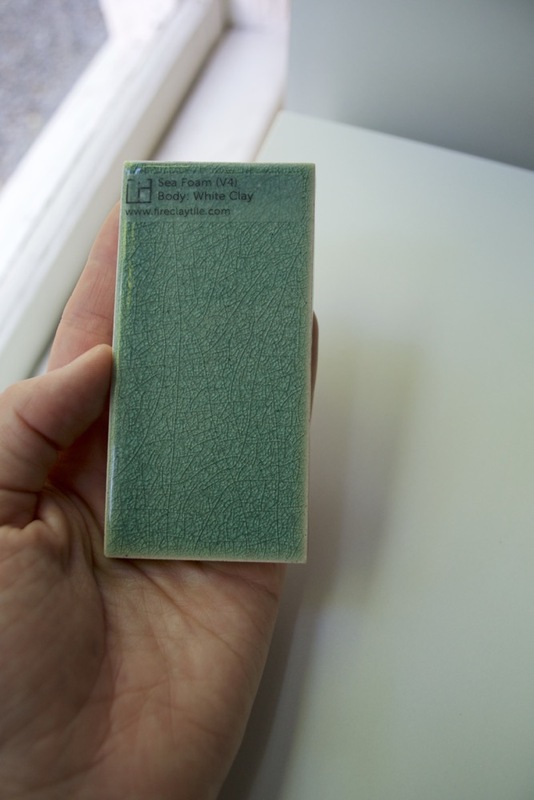 I initially discovered Fireclay when I saw their gorgeous Ogee Drop that was tiled on a floor. When we got our very first color samples we had decided on another color that happened to be a part of a special collection that had shape options for just $15, one of which was a 4” hexagon. I wanted something a little different than the usual subway tile look, and the hexagon fit the bill so that’s what we planned on doing. Then, we visited their showroom when we were in San Francisco last month and we found Sea Foam, which stole the show. But, during all that I had somehow erased the Ogee Drop from my mind because it was a lot more expensive in the other color. Luckily, I had an epiphany and remembered that since we’re going with Sea Foam and many of the shapes were the same price we could use the Ogee Drop. Hooray! I’m so excited and it’s basically the tile of my dreams. For one reason or another when it comes to designing a space your first choice doesn’t always win out. So it’s really fun that this time it did. The color is a greenish, gray with a tiny hint of blue. It's hard to capture on camera but these photos come pretty close. I love the crazing and the variation of this glaze.